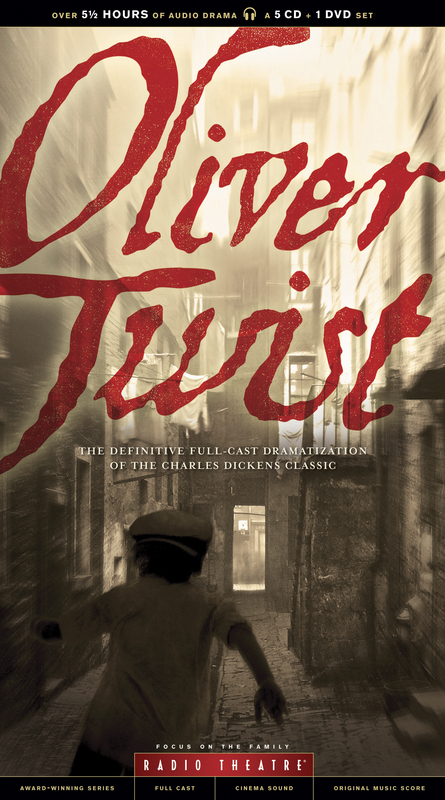 An audio drama of the highest quality, Oliver Twist was recorded on location in London with an award-winning cast. This classic story will steal your heart as the timeless characters are brought to life in Focus on the Family Radio Theatre’s edition of Charles Dickens’ beloved tale. This amazing audio production comes on five CDs, with a bonus DVD that includes behind-the-scenes production footage and the documentary Modern Day Oliver. Purchase of the product also benefits Focus’s “Wait No More” adoption initiative. With cinema-quality sound and an original soundtrack, this audio drama tells the story of a young orphan sent from a child farm to begin life in a workhouse. After committing the unpardonable offense of asking for more food, Oliver is sent off to apprentice with a coffin-maker whose wife mistreats him. He runs away to London, where he meets the Artful Dodger and Fagin, who trains kids to be pickpockets. Despite his many trials and hardships, he finally gets his happy ending, bringing hope for redemption to all around him.